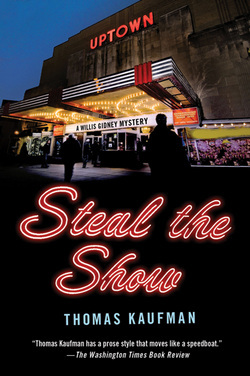 Steal the Show - Doug Grad Literary Agency, Inc. Growing up homeless on the streets of Washington, D.C., private investigator Willis Gidney has a soft spot for children in trouble. So when Gidney tries to adopt an abandoned baby, he takes a case he shouldn’t, leading him into a hornet’s nest of street gangs, illegal film pirates, and three Hollywood types with galaxy-sized egos. Now Gidney will have to think fast if he wants to keep the baby in diapers and formula—and keep himself alive. In DRINK THE TEA, Willis Gidney found an abandoned baby. Now he’s decided to adopt her. Unfortunately, private eyes aren’t usually thought of as ideal parents. That means lawyers, and that means Gidney needs money. So he takes a job he shouldn’t—he takes cash from a code-writing hacker named Rush Gemelli to break into a film pirating center in Washington, DC. Gidney thinks this is a one-time venture, but Gemelli has other ideas. He blackmails Gidney into joining up with Gemelli’s father, the head of the motion picture lobby in Washington, Chuck Gemelli—known as "The Elephant." The Elephant is under attack for letting film pirates devastate Hollywood profits, to the tune of seven billion dollars a year. His solution: bring in Hollywood’s top director and stars to premiere their latest film in DC, proving that movies can be sent directly to theaters via satellite, eliminating film piracy once and for all. All you need is an unbreakable encryption code. The Elephant’s son will write the code. But as Gidney’s computer-savvy girlfriend Lilly warns him, there’s no such thing as an unbreakable code. Working for the film lobbying group, Gidney forms an uneasy alliance with retired FBI agent Boynton Cleary, the Elephant’s chief trouble-shooter. Together they discover a plot to steal the film at the première. The clues point to Rush Gemelli—it seems he wants to use the code to steal the movie at the premiere, sell it on the black market, and destroy his father, all at the same time. But just as Cleary and Gidney overtake Rush Gemelli, Gidney finds out he’s been set up—the Elephant has two sons, and Cleary is the one out for revenge. Add to that the unwanted attentions of a crazed actress, the DC case worker from hell who’s determined to keep Gidney and baby Sarah apart, and Vietnamese and Salvadoran gangs out to kill him, and it’s all Gidney can do to keep from getting his ticket punched—permanently. Thomas Kaufman is an Emmy award-winning motion picture director/cameraman. Since graduating from USC with an MFA in Film Production, he has worked as a Director of Photography on documentary and commercial. In addition to working as director/cameraman for National Geographic and Discovery Channels, Kaufman has also shot documentaries for the BBC, WGBH, WNET, and independent producers such as Charles Guggenheim, Barbara Koppel, and Michael Moore. Recent projects include a film about nuclear disarmament, programs for the new Smithsonian Channel, HBO’s Behind-the-Scenes: John Adams, and an independent documentary, Indian Hill. The trailer including an interview with Pete Seeger can be seen at www.indianhillmovie.org. Kaufman has twice won the Gordon Parks Award for Cinematography, and an Emmy for the 1994 documentary about deaf children, See What I’m Saying. Kaufman’s first novel, Drink The Tea, was published by St. Martin’s Press.